It also shows what happens when human actions affect the concentration of greenhouse gases in the atmosphere. Draw a 60cm circle on the ground by holding one end of the 30cm string in one place and using chalk attached to the other end to make the circle. This circle represents the Earth. Draw a larger circle (about 460cm diameter) around it using the longer string. This circle represents the Earth's atmosphere. This game is played in three rounds or more. Each round takes about 30 seconds. Two students are CO2 molecules and stand anywhere in the "atmosphere". They must not move their feet during the game. The other students are the sun's rays. They must try to reach the "Earth" (to touch it with a hand or foot) and then escape through the atmosphere without being touched by a CO2 molecule. Rays that are touched by a CO2 molecule must stay standing still in the "atmosphere". Rays must only try to reach Earth once. Rays that have escaped into space then make a circle around the atmosphere. How many rays have been trapped in the atmosphere by CO2 molecules? This represents the amount of heat energy from the sun that has been trapped in the atmosphere, which is called the greenhouse effect. Discuss how this affects the temperature of Earth. Remember that a certain amount of CO2 is required to keep the planet warm enough to support life. What happens if the amount of CO2 in the atmosphere is increased? First of all remove any sun's rays that were trapped in Round1. 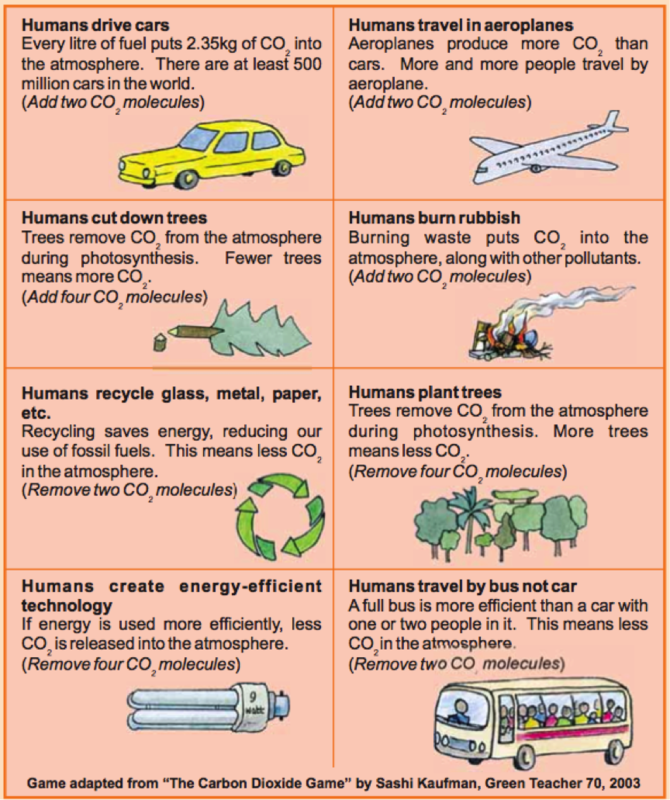 Take a Human Action card out of the bag (which contains only actions which add CO2). Add the appropriate number of CO2 molecules to the two that are already in the atmosphere. Repeat the game, picking a Human Action card out of the bag, which now contains all of the cards, so the number of CO2 molecules can go up even more, or go down. The game should illustrate that when the amount of CO2 increases, more of the sun's heat energy gets trapped, and the temperature of the Earth goes up. Burning fossil fuels is one of the main ways humans increase the amount of CO2 in the atmosphere. When human actions reduce the amount of CO2 in the atmosphere, the greenhouse effect is less strong.